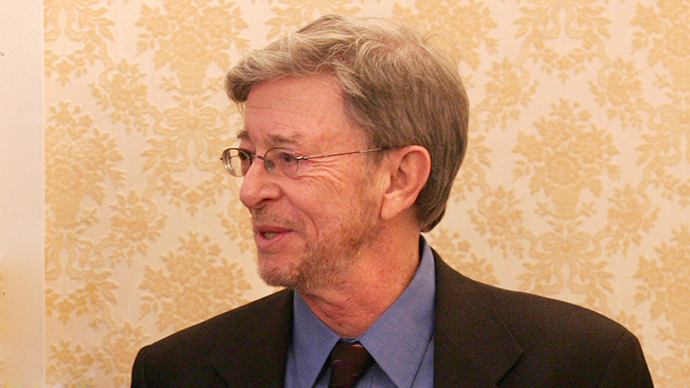 Regarded in US academic and media circles as “Putin’s apologist” and criticized by Democrats and Republicans alike, Prof. Stephen Cohen plays a crucial role in the modern political discourse, where a “You’re either with us or against us” mindset reigns. I was recently invited for a ride-along to Mikhail Freydlin’s bookstore in Queens by a friend of mine, a prominent Russian diplomat whose career ended at a high-level position in the UN. We shared the car with a married couple of ex-diplomats now teaching at US universities, both from Ukraine. My friend’s wife was from Kiev, too, so it was quite obvious that the sore spot, i.e. Russian-Ukrainian-Western relations – would be best avoided. However, the ride was long, and as we filled our time with some abstract academia talk, everything went well. But then someone mentioned a recent conference in Washington held by the US-Russia organization where Stephen Cohen was a central figure, and I made a remark that probably no one in America knows and understands Russia better than him. No one argued with me, but the conversation stopped. And I’m sensing it will not be resumed. In Soviet times, one didn’t have to be a scholar acquainted with the American academia to know Stephen Cohen’s name. Just like Marshall Goldman and a number of other experts on the USSR he was referred to by the Communist party ideologists as an agent of the State Department, or the CIA, or Zionism, whose sole purpose was, in their view, to undermine the foundations of socialist statehood. Cohen has never been ultra – neither on the left nor on the right – but his historical interests, i.e. Russia and the socialist system, put him on the list on the regime’s ideological enemies by default – while in the US he was time and again suspected of having a soft spot for Marxism. No one was allowed to stay unaligned: if you didn’t put yourself on one or the other side of the barricades, others did it for you. No need to remind about those events and people, which made Russia and its relations with the US very significant again, and brought the two countries to the brink of a new cold war. The unused developments of the old times came in handy for the modern rhetoric. The world however has become much more pragmatic. Ideology is only relevant for fanatics, whereas the modern Russian policy, like that of the US, is determined by very specific interests. Things that are still suitable for a lecture or in media are now irrelevant for real politics. When making big decisions, the current authorities don’t seek academicians’ advice or refer to scholarly research. There are however some expectations, like those who determine the Russian-US policies, and follow Stephen Cohen’s speeches and articles. Cohen was born in America; his grandfather was a Russian immigrant. Stephen majored in Russian and Soviet history and politics at university. While studying in England, he went on a trip to the Soviet Union for his practical training. Cohen received his PhD at Columbia University, and then became a professor at Princeton University, and at New York University. Other than doing his studies and academic works, he maintains contacts with Russia’s leadership and intellectual elites. Cohen developed close ties with Mikhail Gorbachev, Nikolay Bukharin’s widow, Anna Larina, and Joseph Stalin’s daughter, Svetlana. He advised George H. W. Bush. He is usually referred to as a leftie, or a liberal, but he essentially doesn’t belong to any party. Had there been a dissent party, he could’ve easily been its leader. Cohen predicted Perestroika even before Gorbachev, based on hopes for Bukharin’s socialism model. Cohen’s book about Bukharin made a strong impression on the Soviet intellectuals, who cherished an illusion of “socialism with a human face.” Thanks to Cohen, Bukharin’s name was reinstated. He was politically rehabilitated in the Soviet Union and in the international socialist movement. Cohen personally helped Bukharin’s wife and son, and many other Gulag victims. He dedicated one of his books to the return of those who had been affected by Stalin’s political purges. Professor Cohen is a regular guest at WABC, the most popular American radio station. WABC hosts are mainly ultra-right media celebrities. You can hear Mark Levin’s hysterical talk here; Rush Limbaugh had been stirring up panic here for a long time; but John Bachelor, America’s most reasonable commentator, also works here. Stephen Cohen is a co-host of Bachelor’s shows and what he says sounds shocking to the American listeners. He reminds them about America’s promise not to enlarge NATO membership up to Russia’s borders; he asks how the United States would react if Russia would place its missiles in Canada and Mexico; he reminds them of the Cuban missile crisis, which brought the nuclear powers to the edge of nuclear war. He speaks about Russia’s attempts to develop strategic cooperation with the West, which were rejected by the American government. But not many people support Cohen’s ideas – he is practically a lonely media warrior. Stephen Cohen is extraordinary both in his political orientation and in his personal life. He is married to the legendary Katrina van den Heuvel, the editor of The Nation magazine, which doesn’t hesitate to criticize America’s foreign and domestic policy and the financial elite. Katrina is “drop-dead gorgeous,” an unbelievably beautiful aristocratic and graceful woman. She comes from a family of government officials, diplomats, businessmen, lawyers, writers and actors. But her Princeton years and Cohen’s influence made her a strong opponent of the establishment. She has become one the most prominent experts on the Soviet Union and Russia. She acted as Cohen’s coeditor of “Voices of Glasnost: Interviews with Gorbachev’s Reformers.” A few more details to the couple’s portrait: Katrina is much younger than Cohen and she is rich, unlike Stephen. Her money and her business talent saved The Nation from bankruptcy; she also sponsors many Russian projects. If it is true that man’s accomplishments are determined by what kind of woman is standing next to him, then Cohen’s marriage is a convincing proof of his merits and abilities. The Nation magazine often publishes Cohen’s articles. Here’s an excerpt from one of them: “A new Cold War divide is already descending in Europe… If NATO forces move toward western Ukraine or even to its border with Poland… Moscow is likely to send its forces into eastern Ukraine. The result would be a danger of war comparable to the Cuban missile crisis of 1962. Even if the outcome is the non-military “isolation of Russia,” today’s Western mantra, the consequences will be dire. Moscow will not bow but will turn, politically and economically, to the East… above all to fuller alliance with China. The United States will risk losing an essential partner in vital areas of its own national security, from Iran, Syria and Afghanistan to threats of a new arms race, nuclear proliferation and more terrorism. …Prospects for a resumption of Russia’s democratization will be terminated for at least a generation." I’ve known Stephen Cohen for a long time in that I’ve read his publications and lectures, but I only talked to him once, about 20 years ago during my visit to the US. He wasn’t a celebrity back then, and his attention surprised me. Recently I contacted him by e-mail and asked a question not really expecting to get an answer – today he is popular like a rock star. But he remembered me and answered my question in a very friendly manner and precisely to the point. (Though his answer wasn’t exactly what I wanted to hear.) This was an extraordinary experience for me, because the scientific celebrities who were previously happy to have long conversations with me in Moscow, lost interest in me, when my situation changed. Needless to say that Cohen’s stance and political activism brought about both fame and quite a few opponents and even enemies. His views are clearly at odds with those of the establishment. Mitt Romney sees Russia as the main strategic opponent of the US. Vice President Joe Biden, former chair of the US Senate Committee on Foreign Relations, says that “we don’t think in Cold War terms anymore,” but, just like Secretary of State John Kerry, puts the blame for the worsening relations on Russia. Obama is concerned about the Republicans accusing him of being weak and lacking political will, and he resorts to combative rhetoric more often. If we talk about public opinion in the US, more than 60 percent of the population is negative toward Russia. And in Russia over 80 percent view the US in an unfavorable light. The Duma and Russia media worked themselves into an anti-American frenzy. Meanwhile CIA agent Jack Ryan – a character created by Tom Clancy, the author of Ronald Reagan’s favorite bestseller book “The Hunt for Red October” – is back on American screens, saving the US from Russian conspirators and terrorists. It’s hard to look for compromises and shifts in the countries’ respective stances in this situation. Cohen recently became a professor emeritus, free of the teaching routine, so now he has the opportunity to do what he does best – fight for a lost cause. In American academia and media, Cohen is regarded with anger and contempt as Putin’s apologist, minion or friend. He is criticized by both the left and the right, from the conservative Wall Street Journal and Free Beacon to the liberal New York Times, New Republic, Daily Beast and Newsweek. In his tribute on the occasion of Cohen’s birthday, poet Yevgeny Yevtushenko calls him a unique friend and envies his naivety. I won’t argue with the poet, but in the course of his long life Yevtushenko said and wrote a lot of things that sound naïve today. Garry Kasparov, on the contrary, doesn’t consider Cohen naïve and perceives him as Putin’s conscious ally. I think that accusation in naivety is the best compliment a humanist can get. God was naïve when He hoped that people would follow reason, conscience and duty. I have some objections and criticism of my own when it comes to Cohen’s work. When Perestroika began, I was also writing about an alternative development path for socialism, potentially including even Bukharin’s model. But NEP, Khrushchev’s reforms, Kosygin’s moderate attempts and Gorbachev’s experience showed that socialism and one-party dictatorship are inseparable. Lenin, Trotsky and Stalin understood this and regarded liberal ideas as a deadly threat to a socialist regime. It seems to me that, assessing the current situation, Cohen could strengthen his argument by highlighting the fact that the Russian elite – higher officials, oligarchs, pop culture celebrities – are in no way interested in a conflict with the West, with which they have tied their fates long ago. Their capital and real estate are in the West, their children study there; the West is their safe haven if anything goes wrong in Russia or Putin gets angry. Every single one of them understands that the Western authorities have all the means at their disposal to poison their lives, just the same as the Russian prosecutor’s office. Putin is their hostage, just like they are his. The elite harbor no patriotic feelings and won’t stand shoulder to shoulder with a penniless compatriot who does. I think Cohen doesn’t quite factor into the equation the long-term objectives of American foreign policy. It’s not so much about prejudice and Cold War inertia as it is about fear of the future. It’s clear that the hopes of liberal democracy triumphing in Russia are lost, and if the political and economic situation deteriorates rapidly, other people will come to power in Russia, and Putin will seem like a democrat and a peacemaker in comparison. The West should be ready for such a turn of events. Nevertheless, the role that Cohen plays in the modern political discourse is vitally important, because the existing rhetoric – along the lines of “You’re either with us or you’re against us” – is not helping at all. Cohen is not only a brilliant scholar and speaker, he’s also a prime example showing that an intellectual can actively influence decision-making and situation development, and that it’s possible remain independent at the time when ideas serve those who can pay more. Regardless of how you see Cohen’s role and views, he is living proof that academic freedom exists in the US and that a serious social and ideological debate is really possible there. The opposition should be very grateful to Stephen and Katrina, without whom no one would know about them or print them. But most importantly, the opportunity to express and hear out all the points of view allows society to understand the multilayered picture of the current world better. Limiting this opportunity represents a graver threat to democracy and freedom of thought than any criticism. We should not only use the favorite mantra of fighters against tyranny – “I don’t share your views, but I’m willing to die for your right to express them” – when addressing others, but also keep it in mind ourselves. This article was originally published in V Novom Svete (VNS) weekly.